This article explains key differences between shaders and effects and describes how to implement high-level “effect” functionality and why you might want to. Silverlight provides pixel and vertex shader support in the core runtime instead of a high-level “effect” class. The shader model requires that you carefully assign constant parameters to specific registers in your HLSL so that you can set them from your application code. Consider the following HLSL. By assigning specific registers to these variables, the constants are guaranteed to be in the specified positions so that they can be set from the application side. Wouldn’t it be nice if you didn’t have to manually allocate and track registers and could just refer to the parameter name “WorldViewProjectionMatrix” in your application? In order to make this work, you would need information about how the compiler is allocating registers to constant parameters. As it turns out this information can be obtained at compile-time from the shader compiler. However, Silverlight doesn’t ship a shader compiler with the runtime or the install size would increase considerably. A solution to this dilemma is to extract the information at compile-time into a format your application can read and then embed this as a resource alongside your compiled shader. Conveniently, I posted the previous article on the HLSL Build Task with Visual Studio Integration which does all of those. The constant table is exported to an XML file which looks like the following. This XML can be easily parsed by application code to determine which registers were allocated to a specific constant, and that’s what the rest of the article is about. Load a vertex and pixel shader pair from an assembly – Implementing an effect typically means configuring both a vertex and pixel shader which collaborate to produce the final result, so it makes sense to group these together under a single “effect”. David Catuhe did exactly this for the Effect class in his Babylon Engine, and so I’m going to walk through what that looks like. This constructor loads the shader byte code from the named assembly and loads the constants XML file. 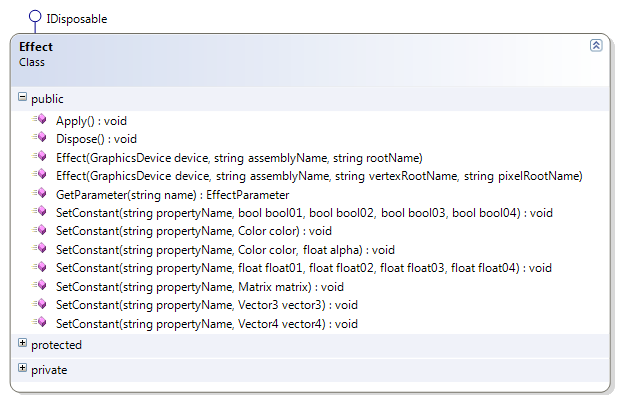 The constants file contains all of the information needed to determine which register a named parameter is in. This implementation stores the values in a dictionary for later reference when setting a named constant. It also allows the parameter to be referenced directly using the EffectParameter pattern to avoid dictionary lookups for greater performance. With the mapping loaded, it becomes very easy to set a constant by name. Finally, we can configure the graphics device to use the pixel and vertex shader in the effect and apply the constants. Putting it all together, you can use the effect like this. So there you go, no more messing about with manual register allocation! Aaron is the founder of Spicy Pixel and works in the technology industry on nifty projects that he likes to write about. The contents of this website represent personal opinion and not necessarily those of his employers or sponsors. Copyright © Aaron Oneal. All Rights Reserved.